Do People With HIV Get More Allergies? Human immunodeficiency virus (HIV) is a virus that infects and destroys certain types of white blood cells (CD4+ T-cells) in humans. The loss of these white blood cells leads to developing various infections, cancers, and other immune problems. Today, there are more than 30 million people worldwide living with HIV infection, with more than 1 million of those living in the United States. When HIV was first recognized in the early- to mid-1980s, the infection rapidly progressed to the acquired immunodeficiency syndrome (AIDS) in most people who were infected. During the 1990s, introducing various antiviral medications had dramatically slowed or even prevented the progression of HIV infection to AIDS. People with HIV are living longer and are developing other chronic diseases common to non-HIV infected people, such as various allergic diseases. People with HIV infection are known to have high levels of allergic antibody (IgE), especially as the CD4+ T-cell levels drop. These high IgE levels are not likely to be indicative of worsening allergies, however, but are likely a sign of worsening immunodeficiency due to B-cell dysfunction. The IgE antibodies are directed against various pathogens (including HIV), rather than against allergens. 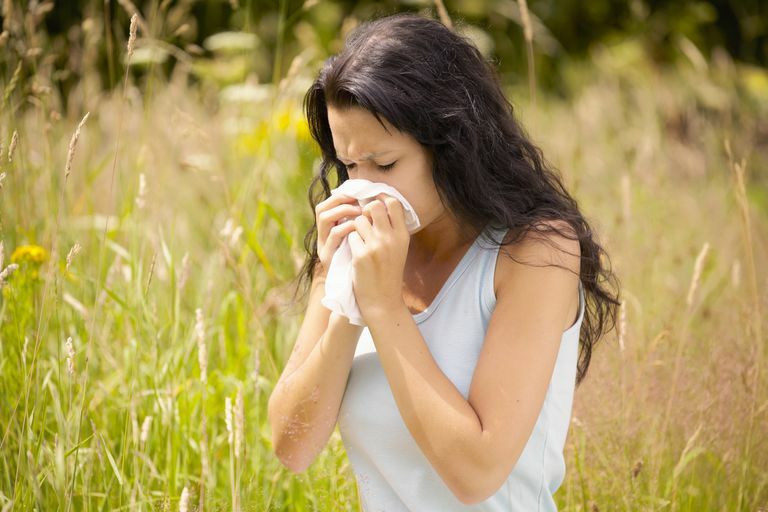 People infected with HIV frequently do experience high rates of allergic conditions, however, including allergic rhinitis (hay fever), drug allergies and asthma. This may be due to ​a disruption in the balance of the immune system, which can lead to the loss of normal allergy control mechanisms, and more symptoms of allergic disease. People with HIV show very high rates of nasal symptoms, with studies showing 66% complaining of nasal allergy symptoms and more than one-third of hospitalized HIV patients having evidence of sinusitis. Various studies also show that people infected with HIV have high rates of positive results on allergy skin testing, compared to people without HIV infection. Treating allergic rhinitis in people with HIV infection is similar to people without HIV. If allergen avoidance is not possible, treatment with oral antihistamines, nasal steroid sprays, and other allergy medicines can safely be used. Allergen immunotherapy, or allergy shots, is somewhat controversial in people with HIV infection since the long-term effects of stimulating the immune system through immunotherapy are not known in people with HIV. People with HIV infection have higher rates of drug allergy reactions, likely as a result of disrupting normal immune system regulations. This is particularly true for trimethoprim-sulfamethoxazole (TMP-SMX), which is a sulfa-containing antibiotic. Adverse reactions to TMP-SMX occur in more than half of HIV-infected people (compared to less than 10% of people not infected with HIV). Fortunately, desensitization for TMP-SMX allergy is frequently successful, which is often required to prevent and treat commonly seen infections in people with HIV. Another commonly seen drug allergy is to the HIV drug abacavir. Abacavir is a nucleoside reverse transcriptase inhibitor that can cause a life-threatening hypersensitivity reaction in 5-8% of HIV-infected people. There is a genetic predisposition to abacavir hypersensitivity that should be checked for with the use of a blood test prior to a person taking abacavir. If a person does not have the gene that is associated with the reaction, then abacavir can be safely taken. Treatment of HIV infection with antiviral medications has led to the increase in lung problems seen in these patients. HIV-infected men have been shown in studies to have higher rates of wheezing compared to men without HIV infection, especially in those who smoke tobacco products. HIV-infected children receiving antiviral medications also show increased rates of asthma compared to HIV-infected children not taking antiviral medications. These studies suggest that people with HIV infection are particularly susceptible to the irritant effects of tobacco smoke, and the use of antiviral medications for treating HIV protects against the loss of immune function, which may increase the risk for inflammatory allergic conditions, such as asthma. Treating asthma in HIV-infected people is similar to that in people with HIV infection, although oral corticosteroids should be avoided whenever possible, due to their suppressive effect on the immune system. Stokes SC, Tankersley MS. HIV: Practical Implications for the Practicing Allergist-Immunologist. Ann Allergy Asthma Immunol. 2011;107:1-8.